IAAF World Championships London 2017 organisers have announced the latest sales figure for tickets, with more than 660,000 sold for the Championships, which start in exactly one week. The event, taking place from August 4-13, will also kick off with a bumper opening weekend comprising of a quarter of a million spectators set to flock to the London Stadium over the Friday, Saturday and Sunday sessions. Yet, in spite of the huge demand for the opening night and both evenings of the Saturday and Sunday, organisers will next week issue the last remaining small batch of tickets for all 14 stadium sessions recouped from changes in stadium requirements. This means fans can still catch Jessica Ennis-Hill receiving her reallocated 2011 world heptathlon gold during session 5 on August 6, the exact same night fellow Brit Katarina Johnson-Thompson goes for glory in the 2017 event. 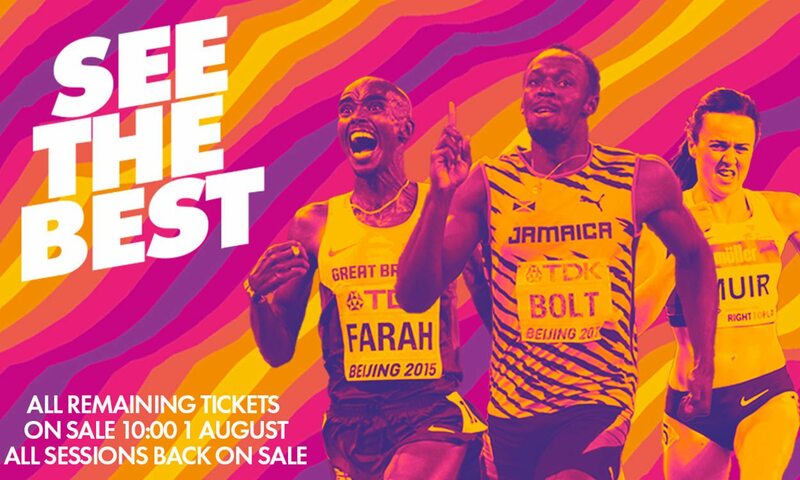 It also marks the final opportunity to secure tickets to see Usain Bolt – whose 100m world record inspired 80,000 children’s sales with his £9.58 priced ticket – take to the blocks in the 100m for the last time during session 3 on August 5. All 14 stadium sessions, including the sold out opening night featuring Mo Farah on August 4, will return to on sale availability for those eager to catch the biggest sports event in the world in 2017 taking place in London. The last chance to buy the small amount of tickets will commence at 10:00am on Tuesday August 1 via tickets.london2017athletics.com. “We are delighted that so many people are set to visit the London Stadium to be part of the IAAF World Championships this summer, but with tickets still available we want to make sure the message gets out there that there is still a chance to see the world’s best athletes in the world’s best stadium,” said championship director, Niels de Vos. Ennis-Hill said: “It is going to be a special night for me and I am honoured that the IAAF and the organisers of the London World Championships have offered me the chance to receive my medal in front of the British fans. The IAAF World Championships London 2017 is the biggest event to be staged at the London Stadium since the 2012 Olympic and Paralympic Games with 2,000 athletes from 200 nations set to compete across 14 sessions in the London Stadium as well as among London’s most iconic landmarks for the marathon and race walks.